Here is you chance to win the Mommy Cards that everyone is talking about! This giveaway is for .jpg and .pdf file of a custom mommy/calling card. With this file, you will be able to print them on your own – use your own computer printer or take them to your favorite print/photo shop. The file is yours to keep. Print as many as you want, whenever you want. Each card is personalized with your information. Additional information can be added to the back. This giveaway is open to all participants – worldwide. For your chance to win, head over to my business (Fruition Designs), take a look around, and then come back and tell me your favorite design (don’t worry – you can change your mind if you win!). I’ll leave the comments open until this Saturday, April 26th. Then I’ll draw a winner from my trusty hat. *Also – I am offering a 10% discount on orders of 100 Mommy Cards from now until April 30th. So it you don’t win, you can still get a great deal on some great looking cards! Just use the code BG15 for your mommy card order. You look lovely as well! I like the bethany cards! Your designs are great! Great giveaway! Thanks for offering! I like the Betsy mommy cards! adorable! I love your business! My sister would love the “Marla” mommy cards, I think! Oh me! Please! :) Those designs are all just darling. I have to say Betsy is my fave! I love Tera or Maureen! I like the Bethany or Beverly mommy cards. Would you be willing to take a header and make blogger cards too? They are all pretty. I like the one with a brown background and pink & green swirlies. This would make a great gift for a girlfriend who is moving away. I love the Mommy cards, it is so hard to choose but I like the Tera design best. Love your blog and nice to “meet” another blogger from Nashville. Entering yet again for your adorable mommy cards. If I don’t win (again) I am going to buy some when baby #2 come along. I promise! You look lovely, too! I love these cards. So great for playdate! i LOVE the bethany cards!! 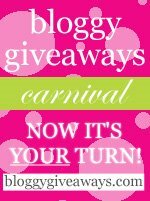 I am running a bloggy party right now too with tons of prizes! Come check us out! i love Bethany Mommy Card! so pretty! I love the bethany cards!!! Karla, I just love your blog. I LOVE THIS GIVEAWAY! I love the Melissa Mommy card. I could see myself handing this out in the parking lot at preschool! Seriously? I have to pick just one? I love the Jamie cards! Ooh!! I remember these from last time. I love the Maureen cards. I love them all!! and I’ll give her a chocolate chip! Cute idea! I think I like the maureen card the best. Thanks! I love the Bethany design! I love the Kate Mommy calling card design, but all of them are so cute it is a tough decision. love, love, love… the bethany cards! I like the Bethany card the best, it was hard to pick, they are all so cute! You do great work. I like the Bethany cards and the Jamie cards, too. I like the Beverly Mommy Card. I like the Bethany mommy card. And not just because it is listed first. I promise. Very tough choice, but my 2 favorites are the Tera and Beverly! You know, maybe if I had some mommy cards, people (including my family members) could keep my children’s names straight, lol. So far we’ve got Nolan, Gideon, Haddon, Jamison and Payson due in August. This would be great to have! It’s hard to choose but I think my favorite are the Beverly cards. Thank you for the chance to win. I love these! Well I’ve got it narrowed down to four…Melissa, Tera, Bethany or Patti. Those are great designs! Love the Bethany cards! Thank you! I think this is one of the best giveaways yet, I really would like the mommy cards!!! The Bethany design is my favorite! I especially love that I could spread the word about my blog that way to people unfamiliar with the blogging world! My favorite design is Mary! It’s hard to choose just one design, but I think I like the Maureen card the best. They are all so cute! Thanks for the chance to win! I love the Bethany AND the Maureen – both very pretty. I would love to win! Thanks for the chance! The Maureen is my favorite. Beautiful designs! It is so hard to pick my favorite. They are all so pretty. I think the Cassandra one is my favorite. Lovely cards! Hard to pick just ONE favorite! You are sooo good at what you do! The pinky Beverly Mommy card is so sweet! Hey, don’t forget my giveaways! I love your idea of creating the finle and having the customer print the cards at home. I had a hard time choosing just one, but I love the font on the Jamie cards. Hum, it is between Bethany and Maureen. Thanks for the compliment, what a nice idea! I really like the Bethany one, but there are a couple other favs as well. Very fun and creative way to introduce yourself! 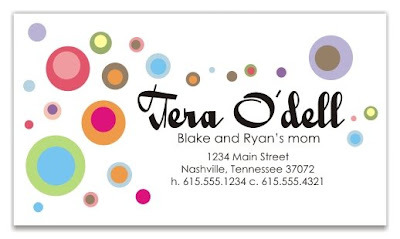 I like the Rebecca & Tara Mommy Calling Cards the best! They are all great though! It’s a toss up between the Beverly and the Bethany. They are all beautiful. These cards are so cute! It’s hard to pick a favorite, but I think I would choose the Kate design – it’s just so cheerful and friendly looking! Thanks for including me in your drawing. I actually like the Tera cards. By the way, can you turn a mommy card into a regular old business card for me if I send you the type? They’re all beautiful but I think Jamie, Melissa and Beverly are my favorites!! I like the Melissa style card! Wow!! I love the Jamie and the Bethany designs! Such beautiful and clean designs! Thanks so much for the opportunity! I love the snowfall holiday card. I love the Bethany design!!! They are all great! I think my favorite is the Maureen Mommy Card!! My two top picks are Marla Paisley and Jamie. Thanks for the great prize, lovely lady!! Check out my giveaway, too! I love the Bethany cards! These are a great idea! Hmmm, I think I like the Melissa Mommy Card best. But they are all so very cute! HMMMM Tara or Bethany Mommy cards! Love your designs! I love the Jamie cards. That’s a really neat font. I love the Maureen design, but they are all cute! I love the Bethany Mommy Cards! So pretty! Thank you! It was hard to choose, but I like the Melissa mommy card design and the Reason for the Season holiday card. Have fun this week with your giveaway. Don’t forget to head on over to my site so that you can enter mine too! the tera and melisa are my favorite mommy cards! i have shown all of my mommy friends your site and they love the mommy cards! i really can’t decide between the two which one is my favorite! I like the Maureen Mommy Cards. I love Mommy Cards….I like the Maureen design best! These are sooo beautiful! I love the Maureen or the Tera cards. What a great idea! I love the Jamie cards. I love the kate, and the marla and the paisley that I can’t remember :) It’s a great idea! The bethany cards are my favorite, but they are just all too cute!!! thanks! Bethany….you do really nice work. There are a few I really like. I think that my favorite is the Bethany card, though I wish that it had a different background color…blue, maybe. Thanks for the chance to win these! I like the Bethany and Tera Mommy cards! I love the Mary mommy cards, but really, all the designs are just gorgeous! Kate Mommy is my fav! All the cards are beautiful, but I think the Kate Mommy is my favorite!! Thanks for such a great giveaway! Striving to grow in ways that aren't always comfortable.